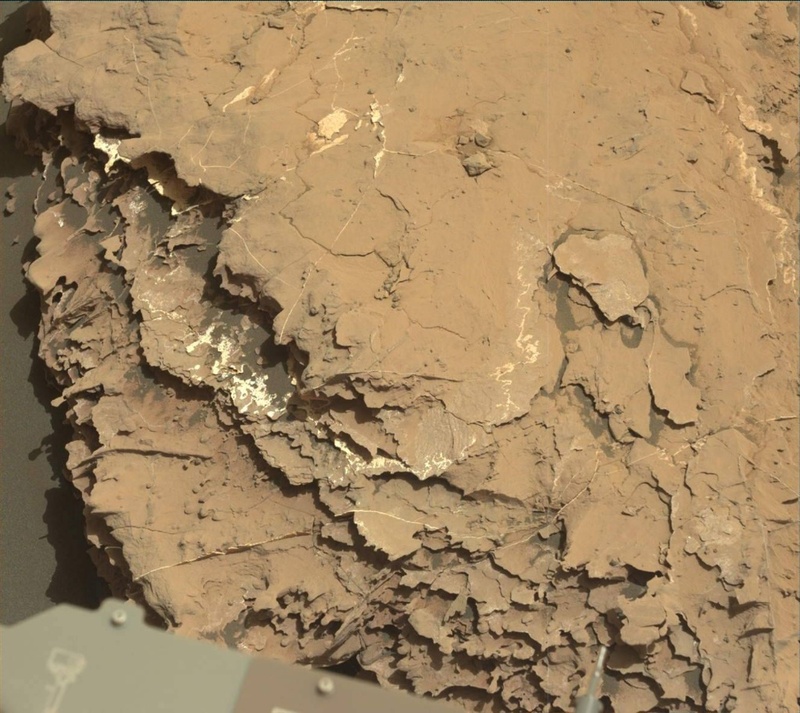 Curiosity is currently investigating the Blunts Point member of the Murray formation, and searching for a suitable location to drill in the near future. I was the SOWG Chair today, and we put together a busy weekend plan focused on wrapping up contact science at our current location and driving further north into the Blunts point member. The plan starts with a ChemCam water adsorption experiment to look for seasonal variations in hydrogen in the soil at different times of day. On the first sol we also planned some juicy contact science: a MAHLI "dogs eye" image looking edge-on at the "Culver" target (seen in the above Mastcam image) to assess the relationship between veins and bedding, followed by DRT, MAHLI, and APXS on typical bedrock at the "Floodwood" target, and additional MAHLI and APXS on the "Carleton" target to look for variations in chemistry. Just as Curiosity wraps up the overnight APXS integration on "Floodwood," we'll put her back to work with another early morning ChemCam water adsorption observation. Around midday on the second sol we'll take several Mastcam multispectral images to document the Sols 2048-2049 DRT targets, along with a ChemCam passive sky observation and documentation images of the ChemCam targets. We'll also acquire ChemCam LIBS on the target "Mountain Iron" to assess the composition of dark nodules. The third sol is focused on a ~10 m drive to the north and post-drive imaging to prepare for contact science or bumping to a drill location next week. We were a bit tight on data volume in this plan due to some small downlink volumes lately, but hopefully by keeping our data appetite in check we'll be in good shape for the exciting activities coming up soon!